It seems a long time since I wrote about William Slaughter’s small leather trunk in the December blog post, with Christmas and New Year falling in between. Now it’s 2015, and the anniversary of the Gallipoli campaign falls this year, reminding us that there were many other theatres of war than the Western Front, during the years of the Great War. 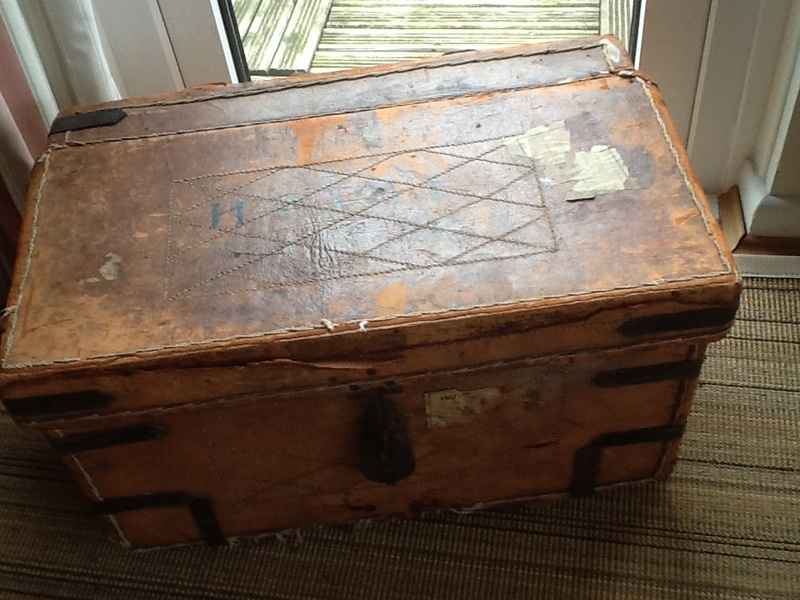 The second chest belonged to my paternal grandfather, Hugh Pike. It is larger than the other [63 x 37 x 38 cm] and not such a quality item, though sturdy. Made of wood, covered in hide and top-stitched, it has iron bands to reinforce the sides. There is an iron lock and fastener, but no key. It bears his name and initials – H. W Pike – on top, and two torn labels, now indecipherable, but possible part of an address. 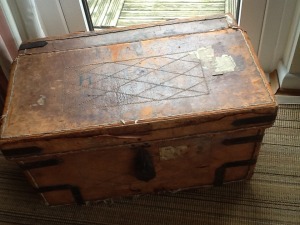 The trunk came to me on the death of my aunt in 2011. 18 Rochester Terrace, Camden Road. 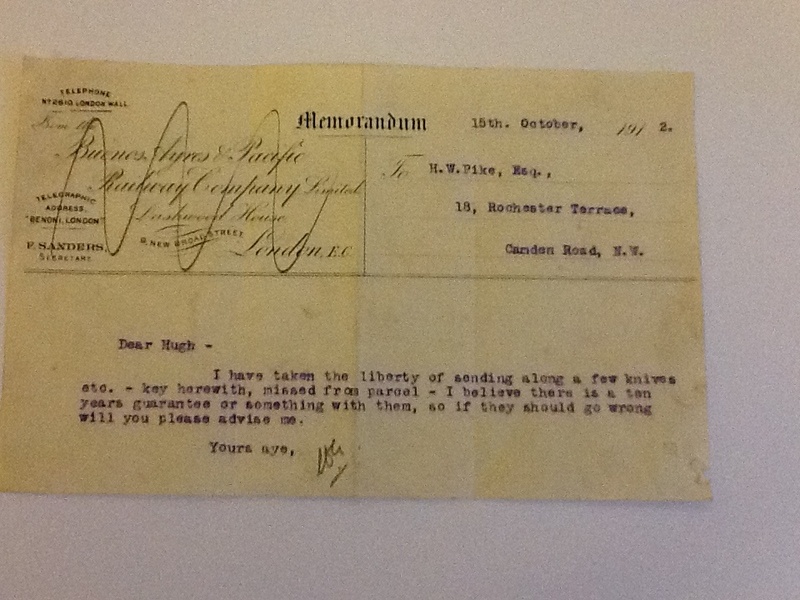 The letter heading gives the address of ” The Buenos Ayres [sic] and Pacific Railway Co. Ltd” [address crossed out]. It is not signed but is initialled , possibly W.G., though it is hard to decipher. I have taken the liberty of sending along a few knives etc – key herewith, missed from parcel. – I believe there is a ten year guarantee or something with them, so if they should go wrong will you please advise me. Perhaps these knives were part of a wedding present. My grandparents, Gladys Kate [nee Drew] and Hugh Pike were married in the autumn of 1912 in the district of Cheltenham. Why this one note should have survived for over 100 years, I have no idea. As to the knives, etc they have long since disappeared, along with the original contents of the trunk. Hugh Pike was in the army during World War 1 and saw service in Mesopotamia [present day Iraq.] He survived, physically unhurt but was affected psychologically and suffered from nightmares for many years afterwards. When I used to stay with them as a little girl in the 1950s, I remember him waking up the sleeping household shouting ‘He’s got me, he’s got me!’ and we would all rush into his room , where my grandmother assisted by the family dog [barking loudly] would attempt to wake him up then calm him down. I wonder if this trunk went on any of his campaigns? 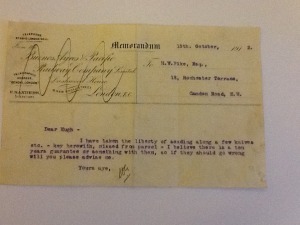 If the letter is contemporary with its manufacture , it pre-dates the war.It seems in too good a condition to have survived the climate and hardships of four years of fighting in the Middle East.During the campaign in the region, more than 31000 officers and men from the British and Indian armies died either in combat, or from disease, or as prisoners of war.Hugh was lucky to have survived. My grandfather never spoke to me about his experiences – he no doubt thought [correctly] that I was too young to understand. He simply referred to it as ‘Mess -pot”. Fascinating – Mess-pot seems to sum up WWI entirely. Just finished reading ‘Young Titian’ by Michael Shelden about Churchill’s early political career up to his resignation as 1st Sea Lord of the Admiralty after the British defeat of Gallipoli when WC takes up his commission as a Major & goes to the trenches in France. I recommend the book. Thanks for the recommendation, Nicola. It looks a good read – and it would be interesting to learn about how WC changed tack completely after the Gallipoli disaster, and subsequently rebuilt his political career.